Apple has confirmed, via its website, the date of its Fall Media Event to be held in San Francisco, California. The date is September 9, 2015 and doesn't come as much of a surprise as 9/9/15 was thrown around many times in the rumor mill. 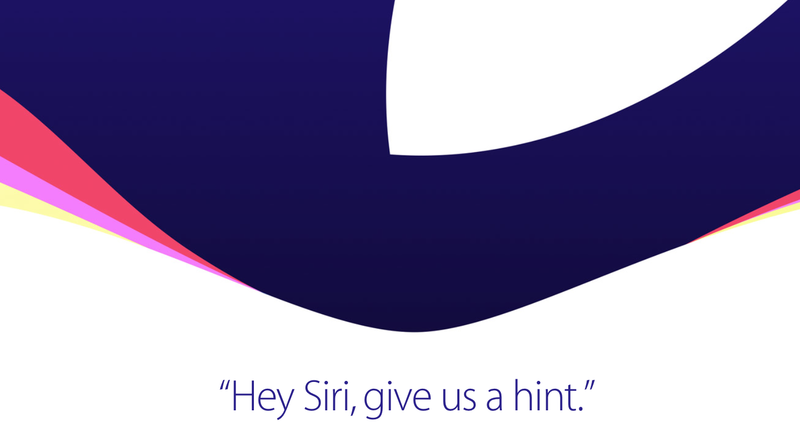 Apple's banner on its website says "Hey Siri, give us a hint." The message has set more rumor wheels in motion as what to expect from the event. We all know September is the month when Apple announces updates to its iPhone. And this time will be no different. The Cupertino company is expected to announce two new iPhones: iPhone 6S and iPhone 6S Plus. The new iPhones are rumored to go on sale starting September 18. In addition to spanking new iPhones, rumor pundits are pointing towards an Apple TV announcement that will hopefully surprise us all. Also in the rumored pipeline is a larger, 12-inch iPad Pro. iOS 9 will take center stage at the event along with the new iPhones. Apple showcased a few features of their upcoming mobile operating system at WWDC 2015 back in June. And now it seems like with iOS 9, we will see a lot of information about improvements to Siri. Siri has been rumored to becoming more intuitive. Check out this post from a few months back, where I wrote about a patent application that was highlighted by Justia Patents, which shows Apple's intent in making Siri more human-like. The Humanized Navigation System (HNS) comes into play when getting directions from Siri. According to the patent application, Siri could soon be able to tell you things like, "Your destination is behind OfficeMax" or "Exit the parking lot near AppleBees restaurant and then turn right towards Golden Ave." More such examples are included in this post, which is an interesting read. Apple will stream the keynote live, which kicks off at 10 a.m. Pacific on September 9 and will be held at the Billy Graham Civic Auditorium in San Francisco. That is the same place where Apple first announced the Apple II computer. Live streams will be available on the Apple TV (2nd or 3rd generation), iPhone/iPad/iPod Touch running iOS 7.0 or later, or a Mac with Safari 6.0.5 on OS X 10.8.5 or later. And for the first time, Windows users will also be able to stream the keynote live. You will need Windows 10 to do so. Of course, I am always hoping for announcements about CarPlay at the event. Hopefully Apple will give us more details about wireless CarPlay, new features, bug fixes and most importantly, new CarPlay compatible apps! Stay tuned for the latest.